Fortnite players can purchase gifts for their buddies with tomorrow’s 6.31 update. Players will finally be able to send gifts in Fortnite Battle Royale once 6.31 update drops, but only for a limited time. Epic Games said the initial gifting period will last one week after the release of the update. If you are in the spirit of giving, you better do it fast. 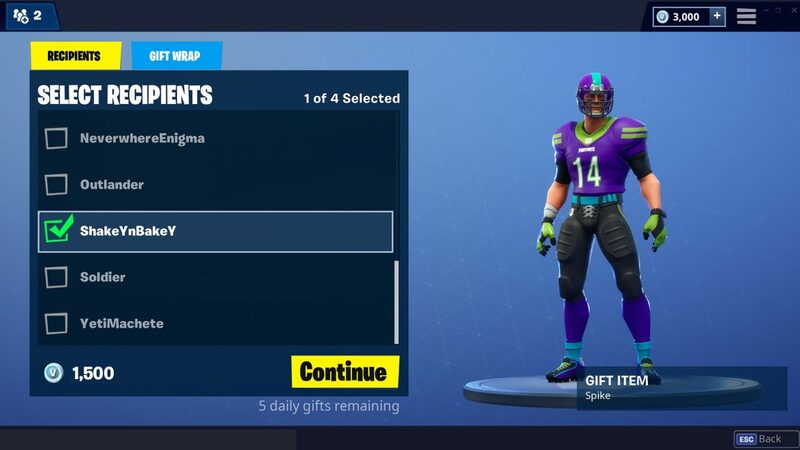 When players visit the Item Shop and choose an item to purchase, they will be presented with an additional “Buy As A Gift” option. Selecting this option allows players to choose which friends to send the gift to. A custom message can be added if they wish. The next time the friend logs into the game, they will receive the gift box with the item. The studio outlined important information on gifting and we’ve posted it below. Make sure you have Multi-factor authentication enabled on your account. You must have been friends with somebody for at least 48 hours before you can send a gift to them. You will only be able to gift three times within a 24 hour period. Any gifts that are purchased are NOT refundable. You can only gift an item that is currently available in the Item Shop. Don’t want to receive any gifts? You can disable receiving gifts under Account Settings in game. Again, the initial gifting period will only last for one week after the Fortnite 6.31 update drops November 28. For those playing on iOS, gifting is not available as it’s prohibited by the curmudgeons at Apple.